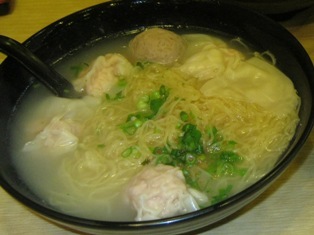 Many HongKongers are crazy about wonton noodles. I am no exception. What make this kind of noodles so special and so tasty are two things: the soup base and the filling of the wontons. If done right, the soup should be made of pork bones, chicken and dried shrimps. The filling should contain 80% of shrimps and 20% of lean pork. If yellow chives are added to the soup, the noodles will taste a lot better. In Chicago Chinatown, there are a few restaurants that offer good wonton noodles, but they are still not as great as those in Hong Kong. The photo that you see was taken in a well-known noodle shop in Hong Kong. Does it make your mouth water? This entry was posted on Monday, July 25th, 2011 at 3:38 pm and is filed under Hong Kong. You can follow any responses to this entry through the RSS 2.0 feed. Both comments and pings are currently closed.